PRODUCT DESCRIPTION: Trappers Choice Grub Stake Lure is a good lure and bait to use for armadillo, raccoon and other nuisance wildlife which are digging in the yard. This is a sure sign they are targeting grubs and when in such a pattern, this lure is a good choice for any type of set. RATE OF APPLICATION: 1-2 ounces placed in the back of the trap either on or just behind the trip pan will usually work. 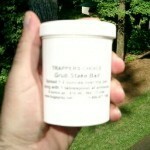 You can also try adding some loose dirt on the bottom of the trap with the bait being placed on top.